Hi, my name is Gary Napiwocki. At the present time, I am 52 years of age and married to my wife, Beverly, for the past 33 plus years. I feel really blessed to have five beautiful children, now all happily married. Our blessings continue to grow with nine grandchildren. As far as I’m concerned, if you want to know where you’re going in life, you have to know where you came from. Getting back to all this family heritage stuff; growing up on a dairy farm in Portage County, Wisconsin. Why Massey? It’s what we first learned to operate; nothing against all the other makes and models. 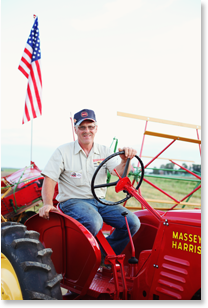 Enter the Massey Harris No.16 Grain Binder. When our grandparents and parents used this equipment, I wasn’t old enough to actually have used it myself. I can remember the smell of bundles of fresh cut oats being shocked; riding the wagon and watching them thresh the grain. Since the restoration of my very own Grain Binder in 2002, which I salvaged from a pile of scrap headed for the junk yard, I for the first time in my life actually operated this finely tuned piece of equipment. WOW! We cut grain, shocked the oats, on a Saturday afternoon along with family, friends and neighbors. What a great time we had! And guess what? The smell of the fresh cut grain, in an instant, took me back to my childhood; bringing back memories of my parents and grandparents, which are no longer with us. Somehow I think Pops would have been proud! I knew then that there was a reason for my father being so persistent on keeping the Belle City Thresher under cover with its paper pulleys and in excellent operating condition. So why do we do this? It’s dirty, dusty, dangerous, and it’s a lot of hard work. I guess it’s to really appreciate what our parents did for us. They didn’t have a choice; that’s what they had to work with. Sometimes we think life is hard work. We haven’t even begun to walk in their shoes. In the spring of 2008 we bought the Massey Ferguson 35 Super self-propelled combine. It had been stored inside for the past 20 plus years. Covered with dust, bird crap and chicken feathers, it didn’t look very pretty in the lineup of machinery at the auction. But as you can see, it cleaned up pretty well. That summer, I combined about four acres of oats, which was somewhat lodged. After an afternoon of being in a constant cloud of dust, the job was complete. The oats were loaded in the gravity box. The straw in a day or two was ready to bale. Somehow I didn’t feel “one with the oat”. That was just too easy! Who would want to do that when they could cut it with a grain binder, get a group of people out in the field to shock it, and visit with their neighbors while doing it? Imagine that. Maybe if it would have rained, then you could go out and open the shocks, let them dry, and go back and shock it all over again; so the sun shined long enough to dry it out. Then you could get a group of people together again to load the bundles onto the wagon only to handle it once again, pitching it into the thresher. Handling it once again, sacking the grain and pitching the straw into the baler, and then of course, unloading the straw one last time. So in the end what happened? Family, friends and neighbors got together, worked hard, visited and laughed – just like the “old days”. Now that’s HERITAGE! Click an image to view the gallery! Check out the heritage related blog posts here! Also read about Gary’s Sawmill here!